Montréal Soccer Blog: What is the MLS? Major League Soccer is the premier outdoor soccer league in the United Sates. As of March 2012, the league will have 19 teams (16 in US - 3 in Canada). It was founded in 1993 as part of a bid for the '94 FIFA World Cup to be hosted in the US. Since the 2002 World Cup, the popularity of soccer in the US has grown tremendously and the MLS has capitalized on that. In the last three years Seattle, Portland and Vancouver have all been awarded expansion teams and have tremendous following/support. The Montreal Impact will be the 19th franchise. Cities in red (with the exception of (Portland, Vancouver, Montreal) have "high potential" for future MLS expansion. 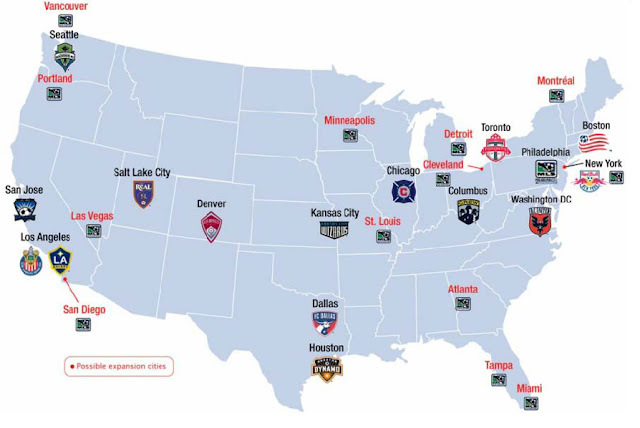 According to http://www.rslsoapbox.com/ , the map below was obtained from "A 2009 document from MLS called the 'MLS Licensee Reference Guide.'" Also, you can go to the following link for an interactive map of the US in relationship to all of the 19 current MLS franchises. http://www.sportmapworld.com/map/soccer/north-america/mls/.